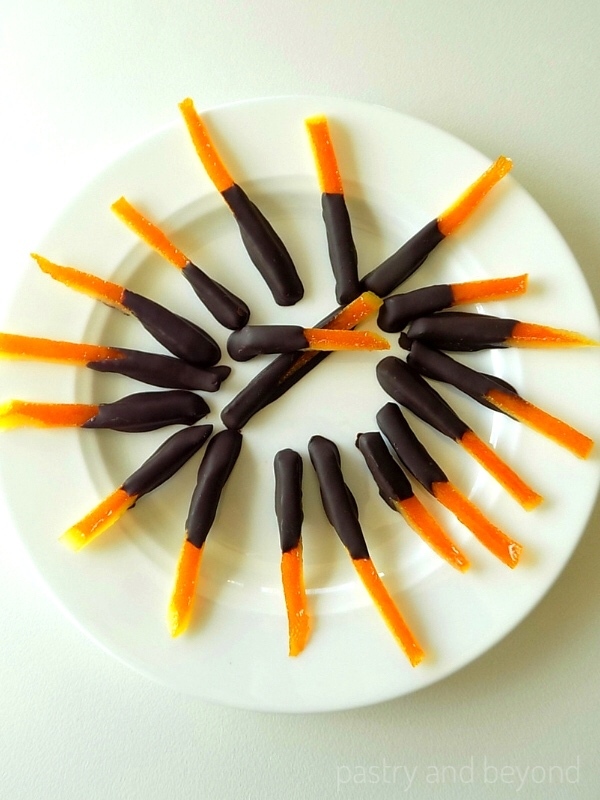 Chocolate-orange lovers can easily make these delicious chocolate-dipped orange peels with simple ingredients! 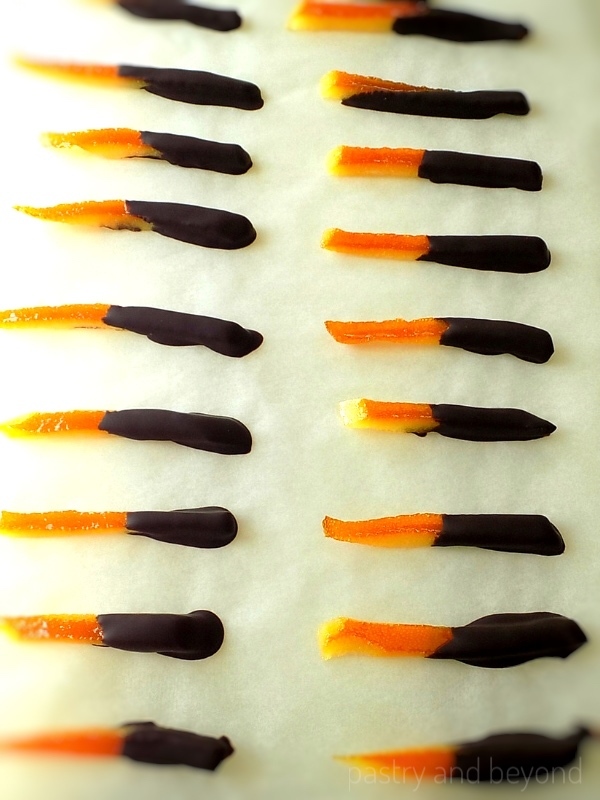 I recently made these homemade candied orange peels for my niece as they are one of her favorites. 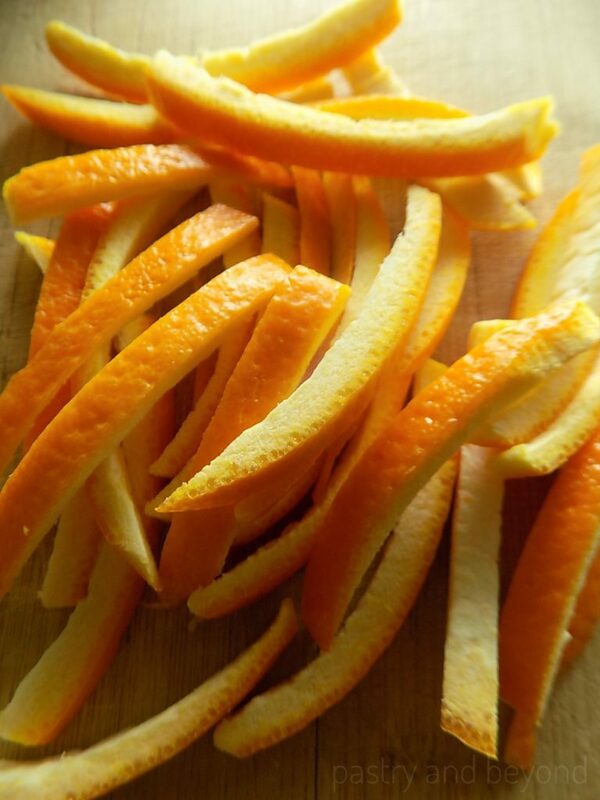 When I saw oranges with thick peel in the market, I immediately grabbed them to make this delicious yet easy recipe. 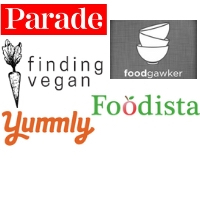 You only need simple ingredients but the result is amazing. How Long Does It Take the Peels Completely Dry? If you want the peels to dry completely, you should wait at least 24 hours. But I don’t wait that long, after 8-12 hours(sometimes even shorter), when they are almost dry, I enjoy these candied peels with melted chocolate. 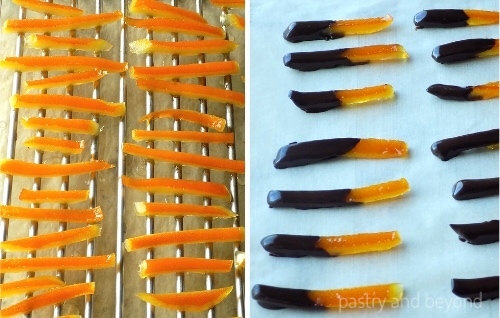 If you like, you can dip the whole candied orange into the chocolate and avoid sticky surface. 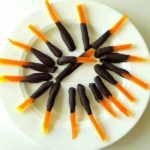 How Long Do Orange Candied Peels Last? You can keep in an airtight container up to a month in the fridge. First, wash the orange well. Then cut off the bottom and top of the orange. Next cut the peel and white skin vertically from one end to other, without taking the fruit part. Finally cut the peels into 1/4 (6mm), 1/3 (8mm) strips. If you take the fruit part don’t worry. You can easily remove that part with your knife. You’ll have so many pieces with 1 large orange. If the orange is not large, you can use 2 medium oranges. Later, blanch the peels to remove the bitter taste of the orange. Put the peels in a pan and cover with water and bring to a boil. Then remove the peels from the pan and drain. Cover the pan with fresh water again and repeat this process 2 more times. Next, place the water and sugar in a medium pan over med-low heat, stir until the sugar dissolves and bring it to simmer. 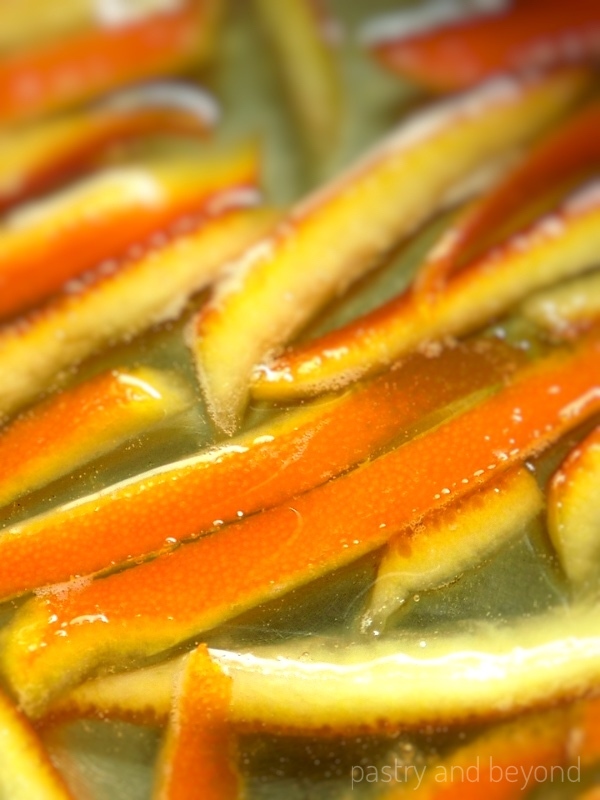 When it simmers, remove the pan from the heat and add the orange peels and lemon juice to avoid crystallization. Then, place the pan over low heat and let it simmer for 25-30 minutes without stirring until the orange peels are almost translucent. Later, remove the pan from the heat and place the candied orange peels on a wire rack and let them cool at room temperature. Finally, dip the peels into melted chocolate. If you prefer you can toss the peels with sugar instead of dipping them into chocolate after cooling 2 hours. If you like orange-chocolate combination, you should also try my delicious chocolate orange shortbread cookies! 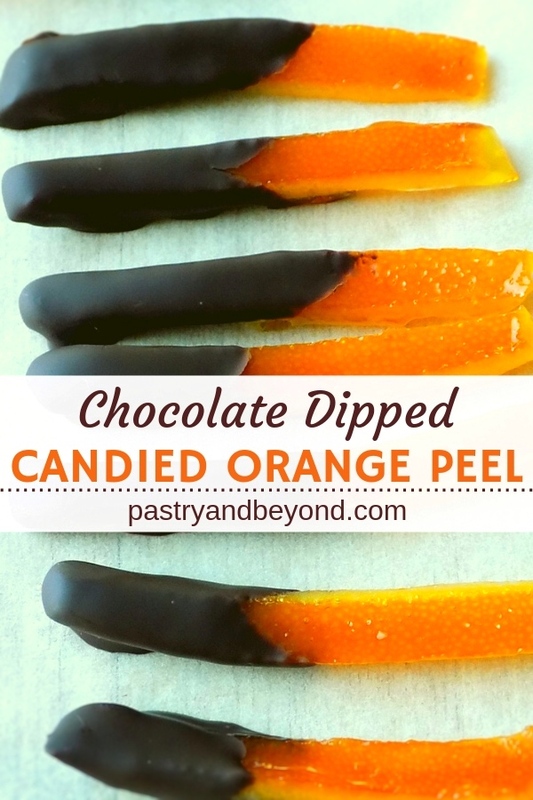 It is so easy to make delicious and classic chocolate dipped orange peels with simple ingredients. Wash the orange. 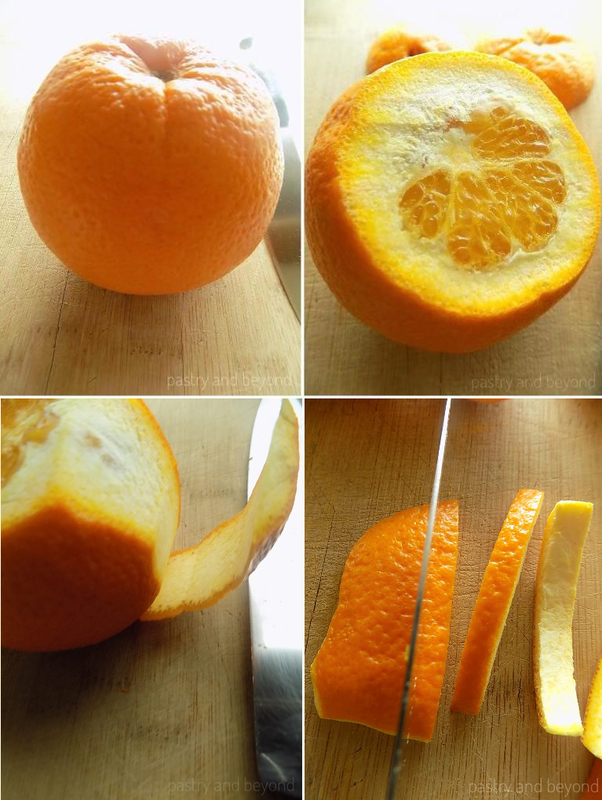 Cut off the bottom and top of the orange. 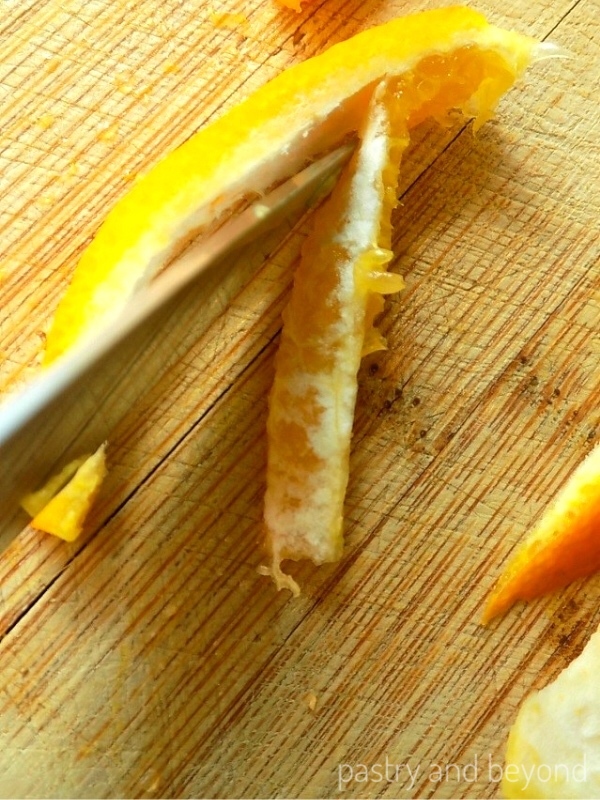 Cut the peel and white skin vertically from one end to other, without taking the fruit. Cut the pieces into 1/4(6mm),1/3 (8mm) thick. Blanching: Put the peels in pan and cover with enough water and bring to a boil. Remove the peels from the pan and drain. Cover the pan with fresh water and repeat this process 2 more times to remove the bitter taste of the skin. Place the water and sugar in a medium pan over med-low heat and stir until the sugar dissolves. Let it simmer. 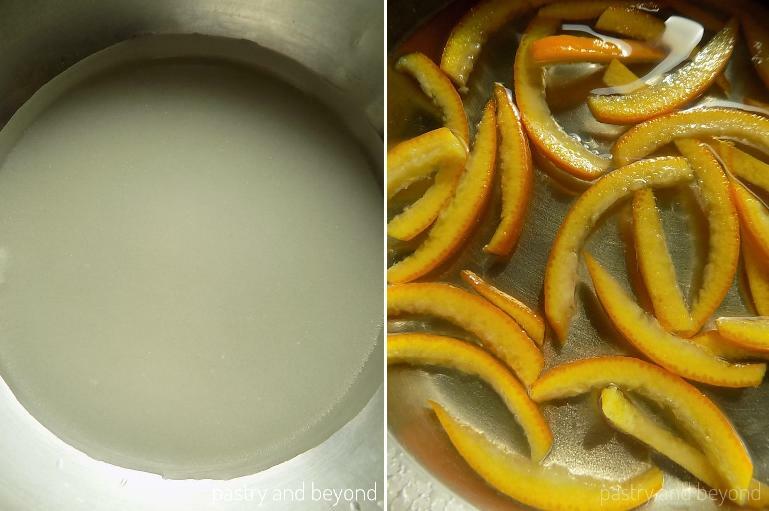 When the sugar simmers, add the orange peels and lemon juice to avoid crystallization. Let the mixture simmer without stirring for 25 to 30 minutes at low heat until the peels become almost translucent and syrup thickens. 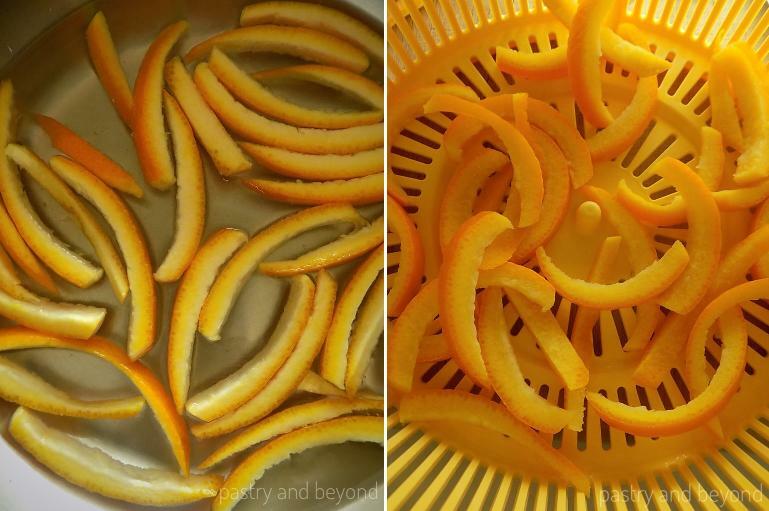 Place the candied peels on a wire rack using a fork or tongs. Let them cool at room temperature. If you want the peels to dry completely, you should wait at least 24 hours. If a slight stickiness is fine, a couple of hours will be enough. Melt the chocolate over bain-marie: Place the chopped chocolate into a heatproof bowl that sits over a pan of simmering water. Stir often. Remove the bowl from the heat when melted. Alternatively, you can melt the chocolate in the oven at 210°F (100°C) by placing the chopped chocolate into a heatproof bowl. You should check the oven often and stir when it starts to melt. If there are some pieces not melted, continue melting in the oven and stir again. *90 grams (3 oz) of chocolate is more than needed if you dip half of the peels but it makes it easier to dip. Update Notes: I published this post first on Feb 19, 2017. Today I only update some of the pictures and add extra information.